classroom they are assigned to. class on the first day of school. name, teacher’s name and their room number. Punch a hole in the top to add some fringe. You can also run a yarn necklace through the hole, so the students can wear it around their neck the first day of school. 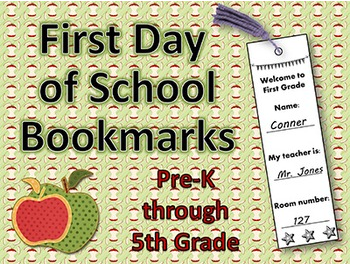 The bookmarks are in black and white, to accommodate those who do not have access to a color printer. • Go to your My Purchases page (you may need to login). Beside each purchase you'll see a Provide Feedbackbutton. Simply click it and you will be taken to a page where you can give a quick rating and leave a short comment for the product. I always look forward to seeing how you feel about my products! If you find an error or have a suggestion for improvement PLEASE email me first at JustWonderfulDesigns@gmail.com, or post your comments to my Question and Answer section before leaving it on feedback. Customer satisfaction and accuracy are very important to me. I am always happy to make corrections and/or improvements based off of customers input. I am quick to respond to your concerns and I would really appreciate the opportunity to make things right before you leave your rating. In addition to receiving notices, as an added bonus to my followers, I send out periodic Follower Freebies, only available to those who are following my store. Copyright © 2013-15 Jean Wilson / JWDesigns All rights reserved.